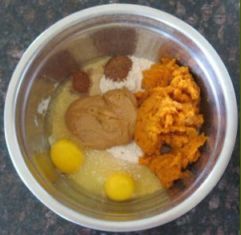 Pumpkin dog treats with peanut butter use canned pureed pumpkin, so you can enjoy these dog biscuits anytime of year. Canned pumpkin is readily available in the fall. If you plan on making these treats at other times during the year, stock up on a few cans and you'll always be ready to bake a batch. Or, if you have ample freezer space, buy a few sweet pumpkins in the fall, and after you puree them, freeze them for future dog treat recipes. Add water as needed to combine the ingredients. 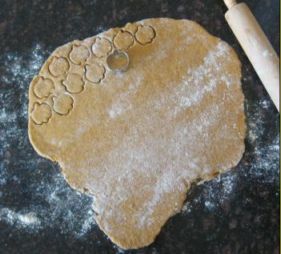 Roll out dough to 1/4" thickness and cut with dog cookie cutters. Bake for 20 minutes (if you want a really hard cookie, bake for 5-10 minutes longer). Leave in the oven to cool overnight. Or, cool completely on a wire rack before serving. 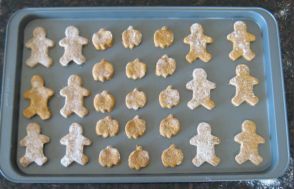 Yield: The yield for these pumpkin dog treats with peanut butter will be different depending on what size cookie cutter you use. I was able to make 12 2" cookies, 15 1" cookies and using a 1" cookie dropper, I made another 20 rounded cookies with the remaining dough. I only baked the drop cookies for 10 minutes. They came out like a crispy muffin, like the blueberry dog treat recipe. I baked them soft because I like to break apart the cookie and serve a little at a time to my intended taste tester. You could easily bake them longer. But I would test how done they are after 10 minutes and then determine how much harder you'd like them. Storage: These dog biscuits are more on the delicate side. Also, since they are not baked hard, they will not last as long. 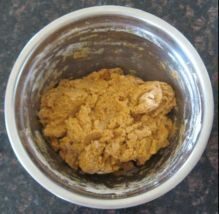 I would recommend less than one week in a dog treat jar, 3 weeks in the refrigerator and 2 months in the freezer. 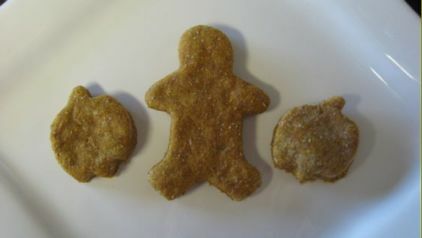 Gloria Danger's favorite doggie cookie recipe!! Gloria just loved these treats. The recipe was crazy easy and came out great. Chef's Comments ~ Great! :) Love the picture, too.